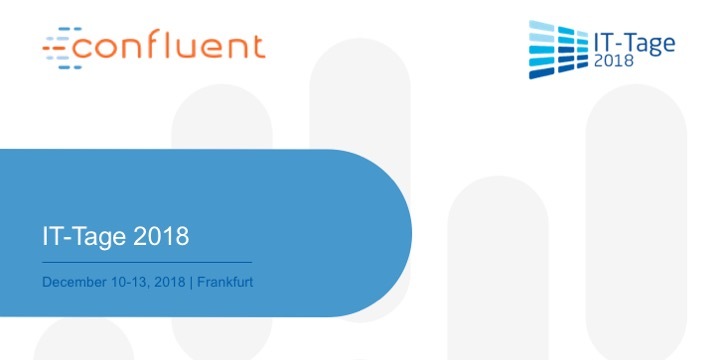 Confluent will be a Platinum Sponsor at the IT-Tage 2018, one of the leading IT conferences around software development, architecture and management, taking place from December 10 - 13 in Frankfurt. Take the advantage of meeting our streaming experts during the conference and learn more about how a real-time event streaming platform can become the central nervous system of your enterprise. If you want to arrange a meeting, please fill out the form and let us know which date you would prefer. We will then reach out to you to define the exact timing and your Confluent contact.